It’s a Saturday morning and being rather excited about the up and coming football, Lucy decides it is best for me to have a hearty breakfast before she becomes a football widow for the day. I love writing food reviews and trying places all over Brighton and Hove, sometimes though it is nice to be close to home and review a place that I love and visit on a regular basis. 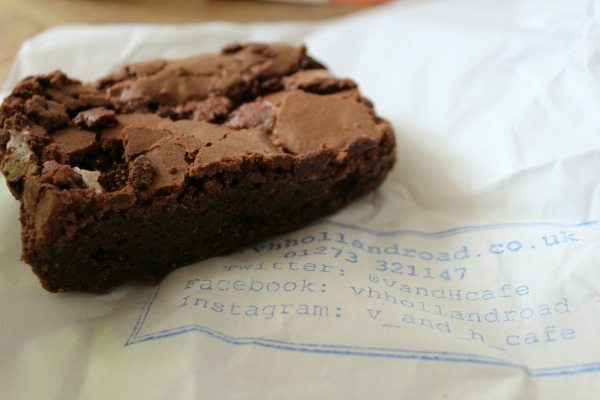 When asked to go to the V and H Café I jumped at the chance, not only can I tell my friends about this wonderful establishment but I can advise the readers to go there as well. 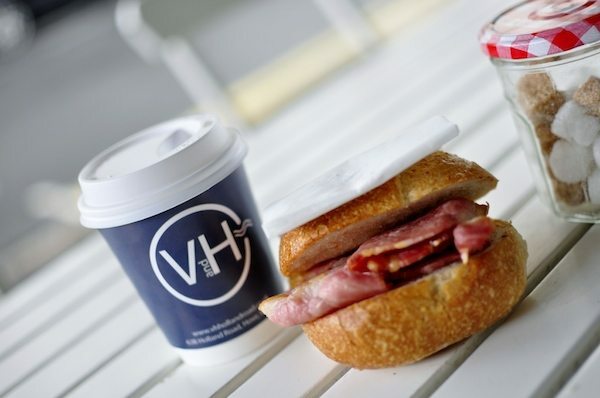 Situated on Holland Road in Hove, V and H is a 15 minute walk to the centre of town so in a great location for a fabulous breakfast whether for midweek meetings on a relaxing weekend brunch. As expected on a Saturday morning the cafe is already busy at 10am and we have managed to get the last table free inside, perhaps still a little early in the year for the outside tables. We pop straight to the counter and we are warmly welcomed as always. All of the staff here are so friendly and passionate about the café, they instantly make you feel at home. Knowing how great the coffee is I order a large black straight away. With beans supplied by Roasted in Brighton not only is this a Fairtrade product, but supplied locally with access to beans from across the globe. Much like everything V and H offer, the coffee beans are supplied from surrounding areas and it is great to see local businesses working so close together. Who needs the large chains? Lucy orders a mocha and then suggests a wonderful idea of adding a fruit smoothie to the order. We both choose a berry smoothie and the flavour is amazing, can a drink taste so delicious and also healthy at the same time? 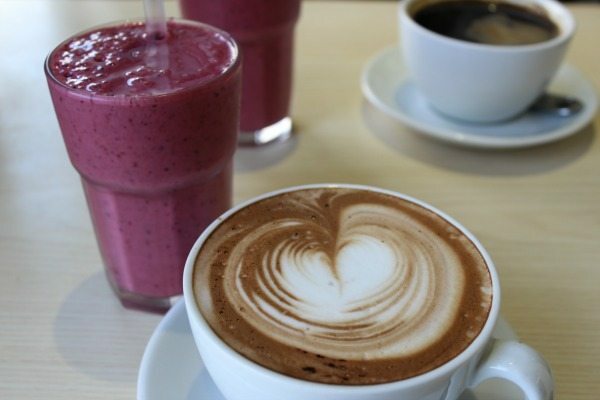 To offset the smoothie a strong hit of a great coffee, dark and robust is just what the doctor ordered. Today I am going to try something off the special board. As I am a regular, I already know how fantastic their array of homemade breakfast muffins are, or their perfect full breakfast, or even a lighter bite of the poached eggs on sourdough toast. 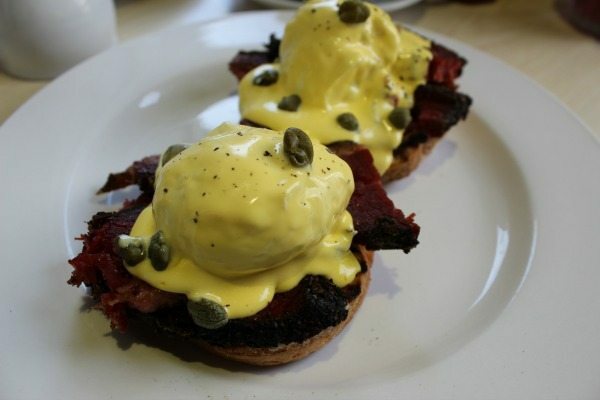 What has caught my eye today is the unusual version of the Eggs Benedict, which is as you expect except with the ham replaced with thickly cut slices of pastrami, hollandaise sauce and the addition of capers and you have a New Yorker as a breakfast treat, well, without the pickles. This wonderful combination of ingredients is served on a homemade muffin and topped with poached eggs. 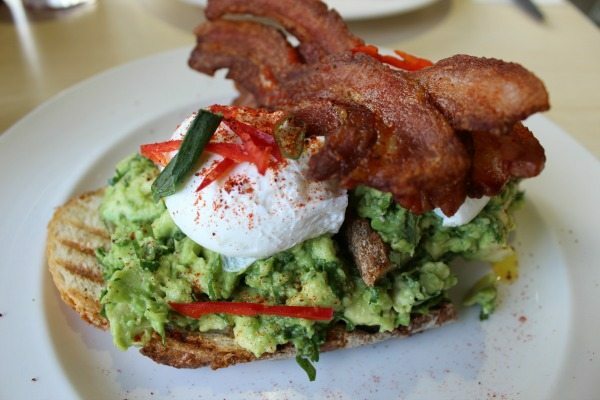 Lucy has decided to go for the smashed avocado with pimento peppers, coriander and spring onion on sourdough toast, topped with poached eggs and crispy bacon. Having been informed that this is the most popular dish at V and H sit hopeful that this will be a favourite of ours too. We carry on slurping our wonderful smoothies and the staff check that we are OK. They are so friendly and you just feel relaxed in the café, it really is a special place which seem to choose their staff carefully. Out comes the food and whilst they check which sauces Lucy will add today I see the thick chunks of pastrami resting on a homemade muffin and begin to get very excited. My first bite is amazing, I have had pastrami in New York and this certainly rivals it, turning what was once a cheap cured meat in to a delicacy fit for any New York Deli. Locally sourced and tasting so delicious this is definitely another winner. The capers cut through the devilishly good hollandaise sauce and are an unusual addition which work wonderfully against the richness of the egg yolk. I take my hat off to the chef as this is something different for breakfast that I would never think to make. It works so well that I will certainly be back again to enjoy this alternative to a breakfast classic. Everything cooked perfectly as always, every bite a treat, the hardest thing here when you visit will be trying to decide what to have off the menu! Lucy tucks straight in to the avocado which she absolutely loves for breakfast, lunch or dinner. The delicate flavour of the coriander and spring onion running through the avocado, with the addition of the pimento peppers just to add a little warmth are a great combination. 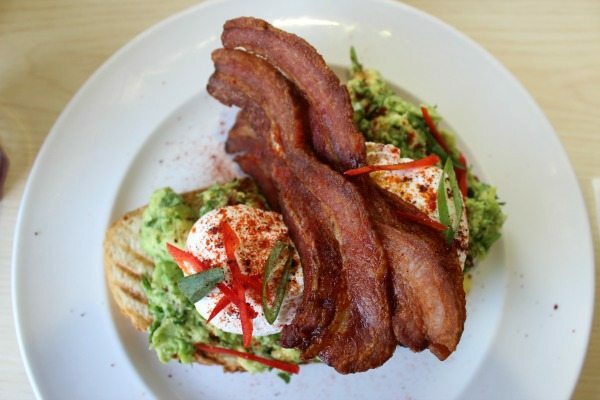 With the crunch of the toasted sourdough and the crispness of the bacon, every bite not only tastes wonderful but also the textures are fantastic, from the softness of the avocado to the warm runny yolk of the poached eggs. So this is why everyone chooses this dish, simple cooking at its best with fresh local ingredients. V and H work with local suppliers who make cakes, scotch eggs and even pies for the café, it’s great to see support for local businesses. We have to grab a salted caramel brownie on the way out… after such a great breakfast this is the icing on top of the brownie as they say! Certainly One Of The Best! As cafés go, in Brighton and Hove, this really is one of the best. Even if you are not local you must come and try it – especially if you choose a sunny day to enjoy the outside seating!